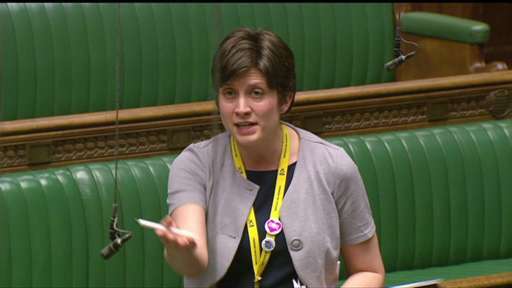 SNP MP Alison Thewliss this week questioned the Prime Minister in the House of Commons, and lambasted his “hopelessly inadequate” reassurances for Glasgow following the UK’s decision to leave the EU. Questioning David Cameron in Parliament, Ms Thewliss asked the Prime Minister what reassurances could be provided for businesses and organisations in Glasgow who have benefited from EU Regional Selective Assistance (RSA) grants and European Investment Bank (EIB) finance. Ms Thewliss said the Prime Minister bumbled his way through the answer and couldn’t give any guarantees to Glasgow. “The Prime Minister’s answer was hopelessly inadequate and will offer no comfort or reassurance whatsoever to companies and organisations in Glasgow worried about their future. “Hundreds of millions of pounds from the European Investment Bank have led to major investment in Glasgow yet we still don’t know what Brexit will mean for the terms of those loans. “It beggars belief that Downing Street had no plans in place in the event of Brexit. Contrast this, for example, to the Scottish Government’s weighty white paper which was in place long before the Scottish independence referendum. “Leaving the EU was always, sadly, a possible outcome when the UK Government legislated for a referendum. The Prime Minister is only now, belatedly and hurriedly, setting up a new department in Whitehall to plan for Brexit. That’s just not good enough; a degree of certainty is crucial for all organisations to plan for the months and years ahead. “The Prime Minister must make it a top priority to get around the country, visit the businesses and organisations who’ll be affected by Brexit, and obtain answers about what this dreadful decision will mean for them”. Alison Thewliss MP: The Prime Minister said that we are entitled to all the benefits of EU membership up until the point at which we leave. Can I clarify if there has been any discussions about access to EU funding, such as Regional Selective Assistance which has created and safeguarded 10,000 jobs and been worth £83 million to Glasgow since 2010 and the terms and conditions of loans issued by the European Investment Bank, which also provided significant amounts of money and require some clarity for local authorities involved in the loans. Prime Minister: What I can say is that any contract entered into before Britain leaves the EU should be honoured in full in terms of EU funding for research or for regions of our country. The status we have with respect to the European Investment Bank will have to be determined as part of the negotiations and that is the sort of technical issue that the [dedicated] Whitehall unit can look at now and see what the options are so that we can discuss them in this House.